The Bronzino Law Firm would like to welcome our new attorney, Alexander M. Jimenez, Esquire, to the firm. Focusing on Family Law, Municipal Court actions, and Real Estate, Mr. Jimenez joins the firm with an extensive mediation background, including earning the status of certified mediator in the State of New York. Mr. Jimenez is a former law clerk for the Honorable John M. Doran, J.S.C., which provided him with invaluable behind the scenes experience into the various family dockets. 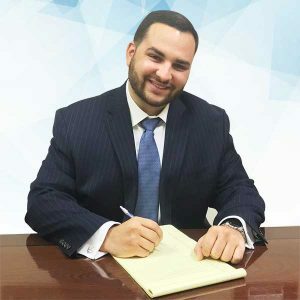 A graduate of St. John Vianney High School, Attorney Alexander M. Jimenez is a life long resident of both Ocean and Monmouth Counties with deep ties to both communities. Give us a call or contact us via our intake form to schedule a consultation at either of our conveniently located Monmouth and Ocean County Offices.